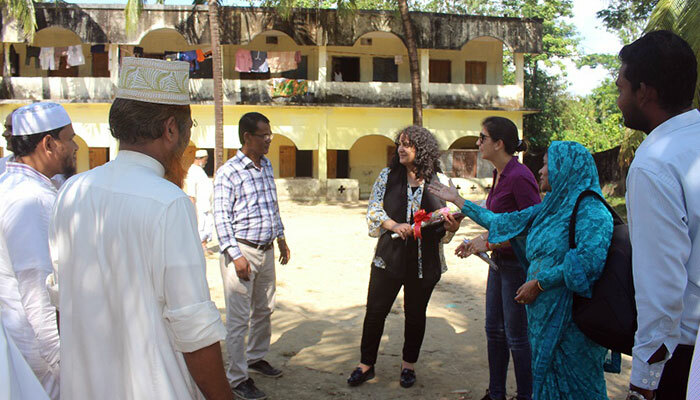 Global Community Engagement and Resilience Fund (GCERF) team consist of Lilla Schumicky Logan, Grants Officer, GCERF and Marine Shahbaji visited different activities of YPSA CEVEC project on 11th November, 2017 at Teknaf Upazila. Different events including debate competition and leadership development training arranged by “SHED”, one of the YPSA-CVEC Consortium partners. At first the team went to Jamiria Darul Ulum Senior Madrasha at Hila Union where the students of this Madrasha (traditional Muslim religious school/college) arranged a debate competition on violent extremism. After the debate competition the team talked to the debaters and audience of the competition to get their opinions on countering violent extremism and their learning from this event. Followed by the debate competition the team visited another event, a training workshop on leadership development at Tekanf Upazila. The team also visited Youth Training Center YPSA-CYC at Ramu to see the skill development training for the drop out and unemployed youth who are vulnerable to be recruited by extremist groups. The visiting team was accompanied by Mohammad Shahjahan , focal person and deputy director, Ms. Khaleda Begum team leader CEVEC Project, Mr. Umra, Executive Director, SHED and Mr. Bathai Mong, Director SHED and other senior official of CEVEC Consortium.